Hi Lovelies~ it’s been a while since I post a My Pick Fashion ~ So here it goes! #1 I love the awesome details. The fact that it’s in plain white makes it less overwhelming. #2 This one obviously very similar, just in pants and suit instead. The center motif really makes a futuristic statement. 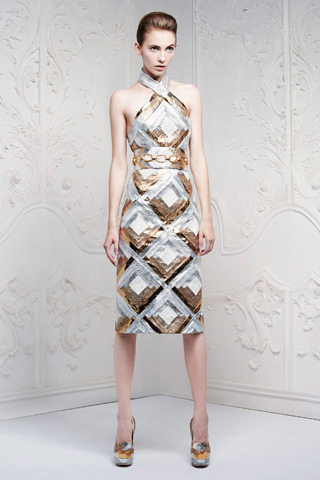 #3 McQueen has always been bold, which is why I love! Though this one is simple enough that I think can be pulled off more easily. #4 I think this is very unique. Plain with dragonfly motif prints. The fabric and color choice is definitely what made this elegant. #5 Finally something from McQueen that can be done as a daily look. 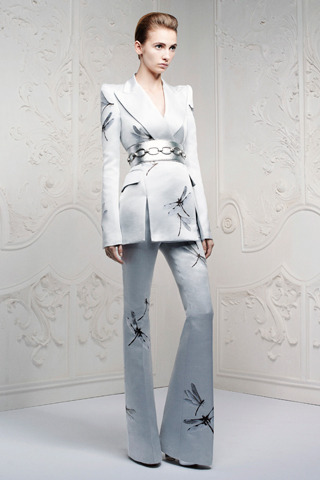 #8 Love the textile, it gives some animal print feeling yet mix with a futuristic motif at center front. she’s not overwhelmed because of the sheer top. #10 This one kind of says to me a “ typical” McQueen look. Elegant Silhouette with detail textile print. Do you have a favorite Designer/Brand? Which one is your favorite piece? ?